I hope you had a great week and an amazing Valentine's. Erik and I stopped going out on Valentine's Day a few years ago and started a new tradition. 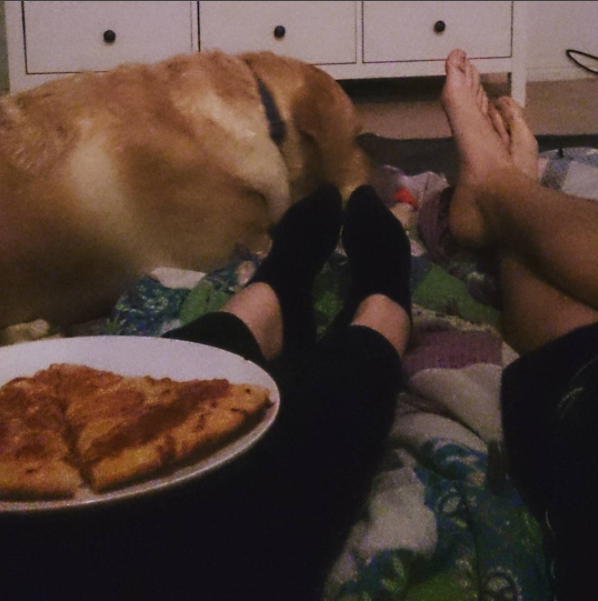 Each year we get a heart shaped pizza from Papa Murphy's and have an indoor picnic. It might be too low key for some but we prefer it to fighting the crowds. This year when I got home from work Erik had Nat King Cole's L-O-V-E playing. It was such a fun way to set the mood. He had my presents set out, the pizza in the oven and even bought some chocolate chip cookie dough and formed it into hearts. I gave Erik his red sleeved baseball tee for his last day of the Fourteen Days of Valentine's. Erik got me a bath tray, bath bombs, a new robe and roses. Then we set out a blanket, opened a bottle of Martinelli's and turned on some Stranger Things. Cause nothing says love like Stranger Things. I love our Valentine's tradition. It is so nice to get away from the hustle and bustle and just be together.